The series finale between the Milwaukee Brewers and Pittsburgh Pirates was postponed Wednesday due to inclement weather. PITTSBURGH — The Milwaukee Brewers sent struggling star outfielder Ryan Braun to Los Angeles on Wednesday for treatment on his achy right thumb. The Brewers planned to play without Braun on Wednesday. Turns out, they didn’t have to. 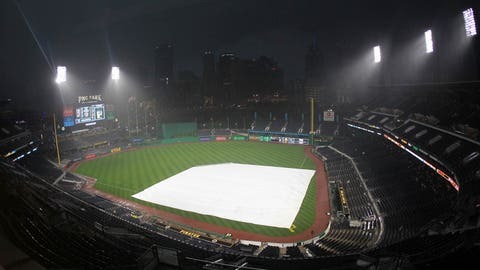 The finale of Milwaukee’s three-game series against Pittsburgh was postponed by heavy downpours at PNC Park that turned hallways leading from the dugouts to the clubhouses into raging rivers. A makeup date was scheduled for July 14 as part of a traditional doubleheader, with the first game set to start at 11:35 a.m.
Officials delayed the scheduled 7:05 p.m. start Wednesday as showers loomed. Groundskeepers took the tarp off around 8 p.m., but quickly put it back in place after another rain band moved in. The game was officially called after a delay of 2 hours and 1 minute. This is the second time this season the Pirates have been forced to postpone a home game due to inclement weather. Chad Kuhl, Pittsburgh’s scheduled starter on Wednesday, will instead get the nod when the Pirates begin a four-game series against Arizona on Thursday. Brewers bullpen catcher Marcus Hanel did his best to have a little bit of fun in the monsoon. He did a series of belly flops on the tarp shortly after the game was officially called. “It’s something that he expects from time to time, and when it starts, we try to get in front of it and knock it out right away,” Brewers manager Craig Counsell said. Counsell said it’s the fifth time Braun has had the procedure done over the last few years. The six-time All-Star is hitting just .236 with eight home runs and 31 RBIs this season and is mired in a 3-for-17 slump. The team also placed OF Corey Dickerson on the Family Medical Emergency List and recalled utility player Adam Frazier from Triple-A Indianapolis. The team offered no details on the reason for Dickerson’s departure, but he will be away from the team at least three days.